Junior group lessons are run at every age level from 4 years to 18. Juniors are taught the basics of tennis, with an emphasis on good technique. Our aim is to give them tennis skills for life, while keeping fit and healthy and having some fun. Our lessons conform with the LTA Tennismark standards for junior tennis tuition and all of our coaches LTA licensed. Click here to see our Junior Tennis Lessons schedule and how to enrol. Juniors ages 4 to 10 years play Mini Tennis, which is designed to allow them to develop tennis skills and play longer rallies in a less challenging environment than a full tennis court. Rackets are shorter and easier for juniors to handle and the balls have a lower compression, meaning they bounce more slowly. 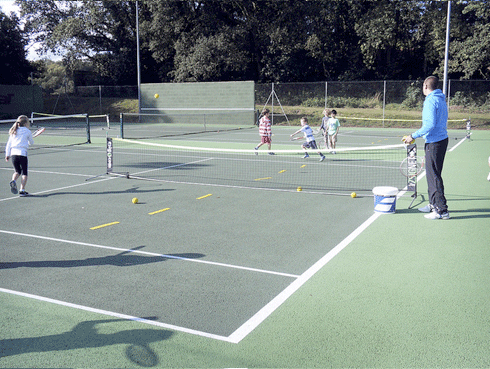 Mini tennis is played on smaller court areas with lower nets. Tots - ages 4-5 years play with Red Mini tennis balls on a shortened court and lowered net. Mini Red balls are 75% slower than a full yellow tennis ball. At these ages, a strong emphasis is placed on developing co-ordination and balance. Green - age 10 play with Green mini tennis balls and bigger rackets on a full sized court with a normal height net. Mini Green balls are 25% slower than a yellow ball. This is the final stage before moving on to full compression yellow balls on a full sized court and helps players develop and improve all aspects of their game. Juniors play with yellow balls on a full sized tennis court and are as far as possible grouped with players of similar ability.